One full-time RVer's take on three state parks located in the Panhandle of Florida. For many years, Florida was my family’s winter vacation destination. We spent holidays and school vacations at popular beach towns like Ft. Myers Beach, St. Petersburg, and Daytona Beach. We stayed in giant hotels on the beach, soaked up the Florida sun, and feasted at all-you-can-eat seafood buffets. At the time it was great fun. 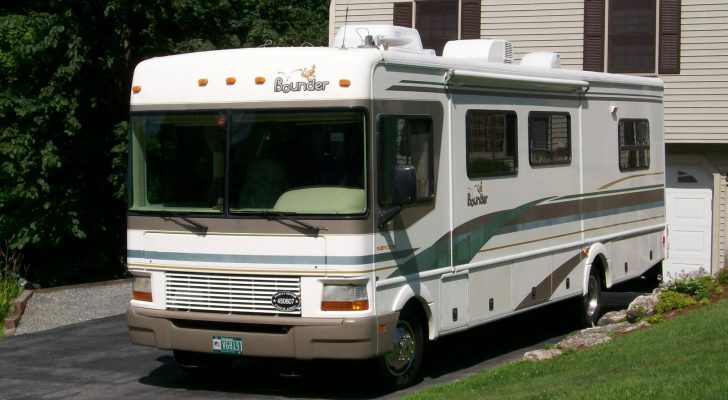 But through the years my preferences have changed, and when we decided to come to Florida as full-time RVers, I was determined to avoid all of that. 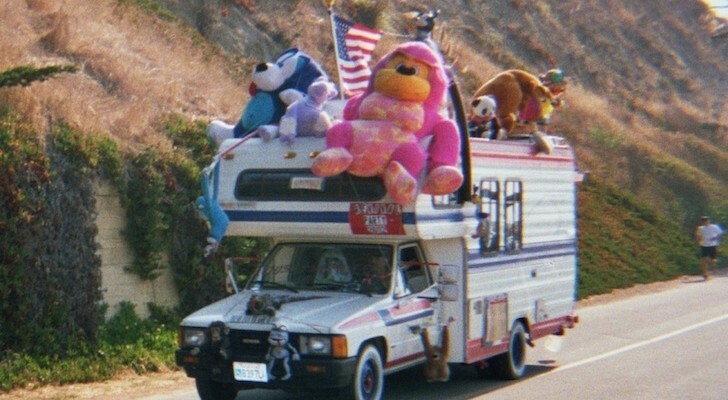 Since we’re not on vacation (we live in our RV full-time and work everyday), I really couldn’t imagine staying in the middle of a bustling tourist town at a tightly packed RV park, surrounded by high rise hotels and surf shops. What we wanted instead was to experience the beauty of Florida without all the crowds and overhyped tourist traps. 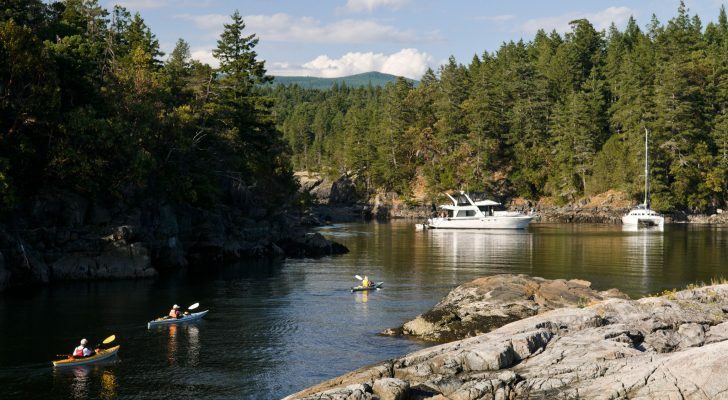 So we chose state parks over resort style RV parks, and laid back coastal towns over the popular beach cities. Our journey began in the panhandle. 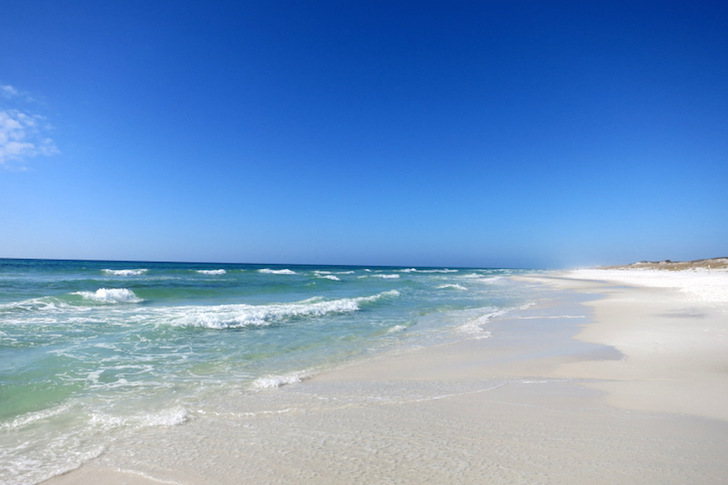 We enjoyed three glorious weeks marveling at the sugary white beaches, exploring small towns along the coast, and enjoying the natural beauty of the Florida state parks. Our first stop was at Grayton Beach State Park. 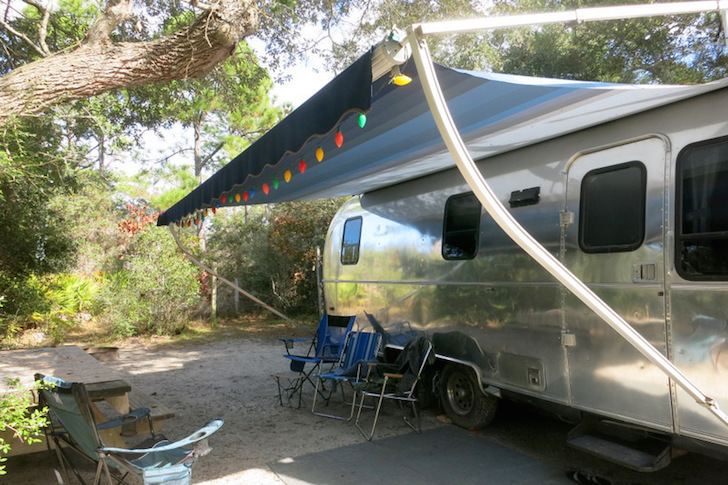 Grayton Beach came highly recommended by our fellow RVers. Everyone raved about the beach and the private wooded sites. Upon arrival it was easy to understand what the fuss was about. The campground has two distinct loops. One loop has sites tucked into a thick forest, while the other loop offers full hook-ups and gravel pads, but little vegetation. We chose the first option. Our site was long and narrow with a fire ring and sitting area at the back. The dense forest undergrowth provided total privacy. We loved it. There aren’t any ocean side sites at Grayton Beach, but with the beach only a half mile away, it’s hard to complain. Nearly everyday we walked or biked down to the long stretch of pure white sand for our daily dose of paradise. It was my first time visiting the panhandle. To say I was impressed by the beach would be an understatement. The gleaming white sand, emerald green water, and soft rolling dunes left a lasting impression. The weather was a bit chilly during our stay at the end of November, but we didn’t care. Despite the nip in the air we spent hours at the beach, walking, biking, flying kites, and watching the sun sink below the horizon. On the rare occasion when we were able to drag ourselves away from the beach, we explored some of the surrounding area. In the charming town of Grayton Beach we ducked in and out of the tiny shops selling local wares, gobbled down fresh seafood at Coast Food + Wine, and mingled with the locals at the Red Bar for some Sunday afternoon live bluegrass music. We also went to the nearby town of Seaside. Not because we care even a tiny bit about the throngs of high priced clothing boutiques or artist galleries, but because we wanted (needed) to have lunch at the famous row of Airstream food trucks. 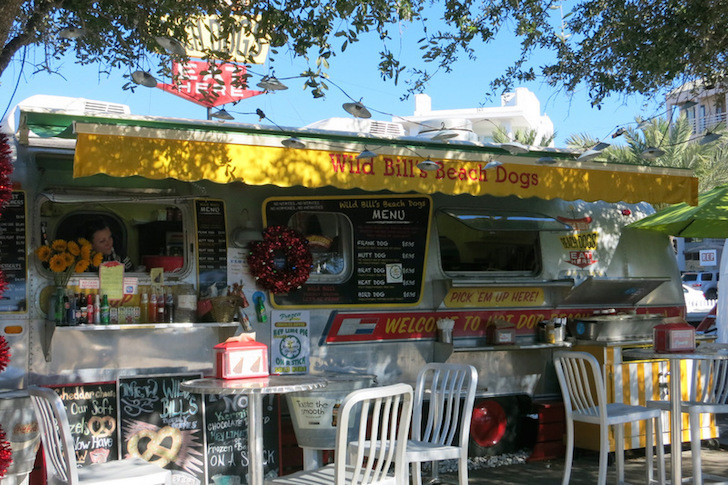 It was insanely busy when we visited, but I patiently waited in line at The Melt Down food truck for my ham & gouda between two thick slices of Texas toast, while my other half indulged in a classic chili dog at Wild Bill’s Beach Dogs. Our second stop in the panhandle was only 45 minutes down the road at St. Andrews State Park. Compared to some of the other well-known state parks in the panhandle, St. Andrews tends to be overlooked. Maybe because of its location right next to the busy tourist town of Panama City Beach. 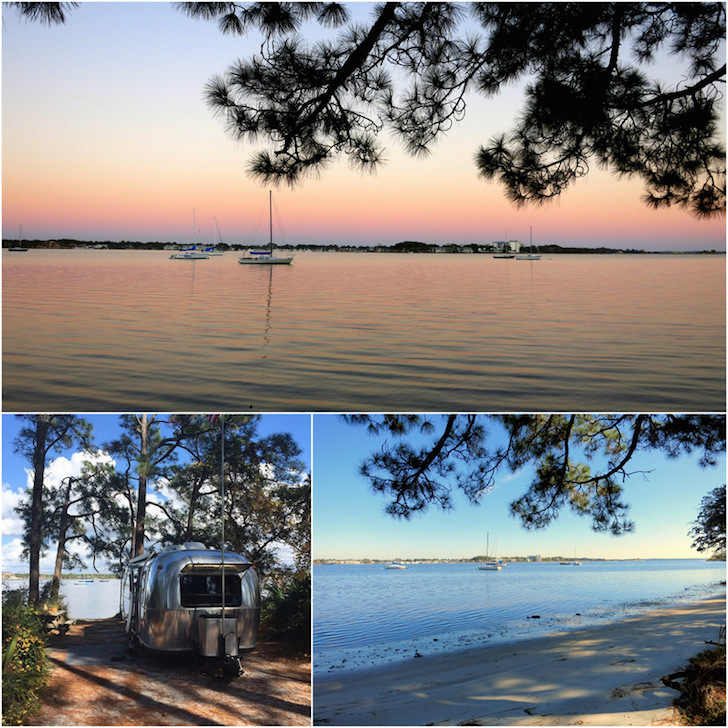 Since we needed to be close to a bigger town for the week due to some pesky dental work (proof that full-time RVing is not all about bumming around at the beach), it was a convenient stop for us – and we loved the campground, too. 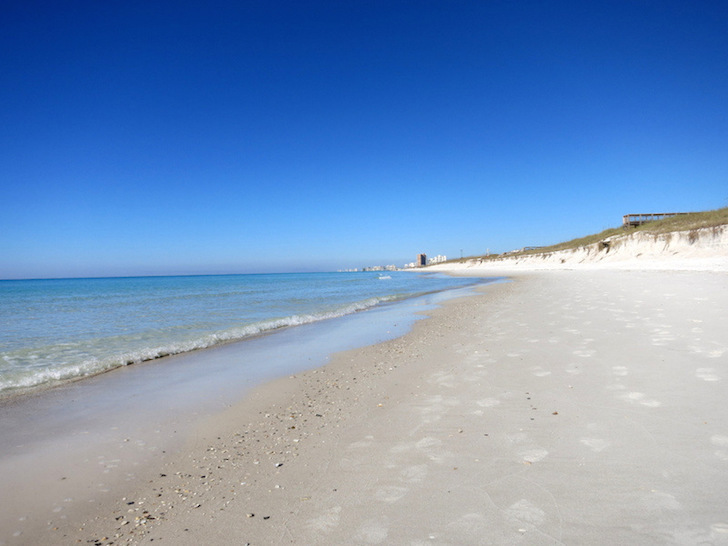 St. Andrews is located on a peninsula at the very edge of Panama City Beach. 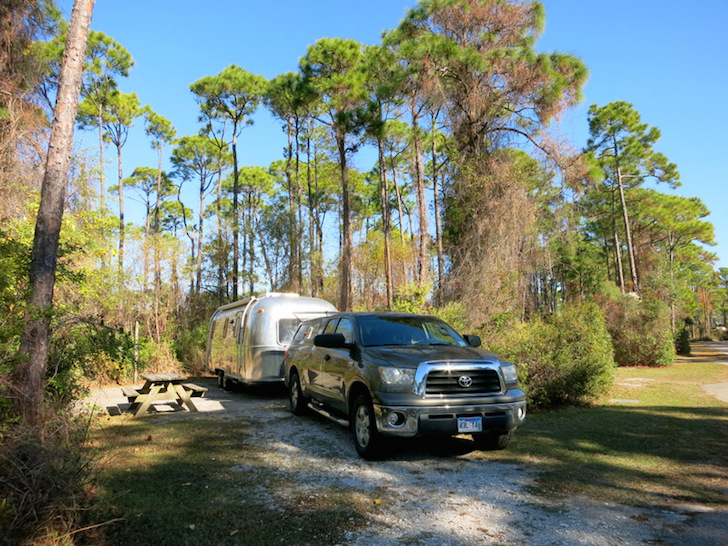 In sharp contrast to the built-up beach town outside of the park, the campground has an almost jungle-like feel with tall pines, a thick palmetto undergrowth, and several interesting inland swamps where alligators are rumored to live. 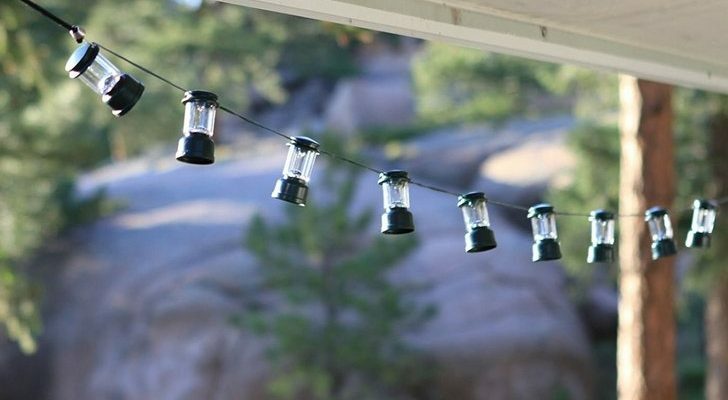 The campground is fairly large with close to 100 sites. Roughly a third face a quiet bay with a marina on the other side. We had site 112, which we thought was one of the nicest sites. With a water view over looking the marina and our own sandy beach, it doesn’t get much better. St. Andrews Beach, a 9.5/10? From our site it was about a 1.5 mile walk or bike ride to the beach. The beach here is maybe one notch below Grayton Beach. There’s still the same pristine white sand and clear turquoise water, but it’s a bit narrower, and you can see the tall hotels of Panama City Beach looming in the distance. To be completely honest, we didn’t spend a lot of time outside of the campground. 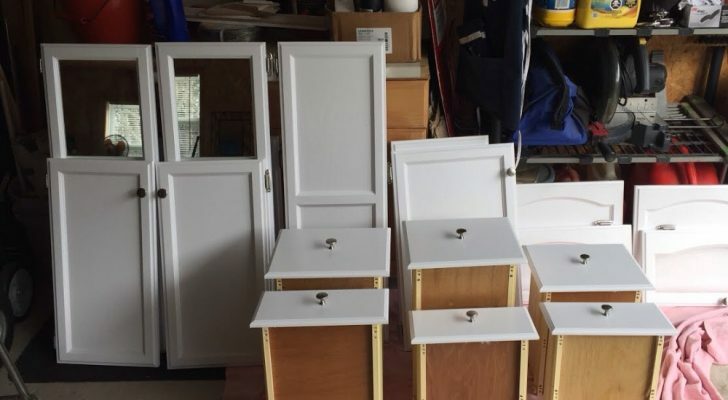 Panama City Beach caters to families on vacation and college kids on spring break. The streets are lined with tightly packed high rise hotels, souvenir stores, go cart tracks, arcades, and a bunch of other attractions – all that stuff we were trying to avoid! Fortunately, it was the off season and most of those places were closed so the town was pretty quiet. 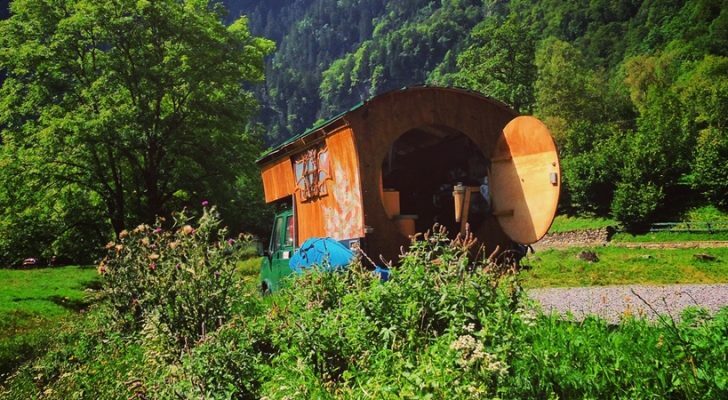 If you’re into those kinds of attractions, yet want to stay at a quiet, scenic campground, St. Andrews would be a great choice. I first learned about this campground from a fellow full-time RVer about six months before we even knew we were going to Florida. 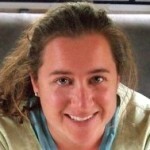 I was so taken in by her descriptions and photos that I immediately began scheming how to get us there. Unfortunately, we were only able to spend a single night because there wasn’t great cell service (we need to have cell service to connect to the Internet for work). 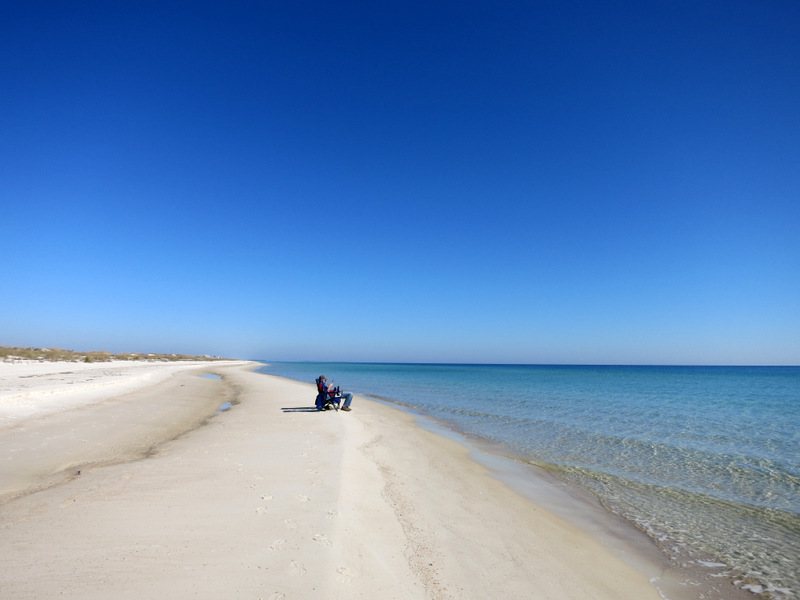 Still, St. George Island delivered exactly what we had come to expect from the Florida State Parks – large sites, plenty of trees for privacy and shade, well-kept facilitates, scenic walking trails, and easy access to the beach. St. George Island’s beach is my favorite! If Grayton Beach is a 10, the beach at St. George Island has to be somewhere up around 15. Gorgeous, perfect, marvelous, exquisite…take your pick. Any and all of these adjectives go hand in hand with this amazing beach. Located on the far eastern tip of a barrier island, and surrounded on both sides by miles and miles of sand stretching as far as the eye can see, this place is truly a beach lover’s dream. After quickly setting up camp, we spent the afternoon strolling down the long, deserted beach scanning the shore for shells. The next day before check out, we went back for more, setting up our chairs in a prime spot next to the water and soaking up every last bit of time we had there. 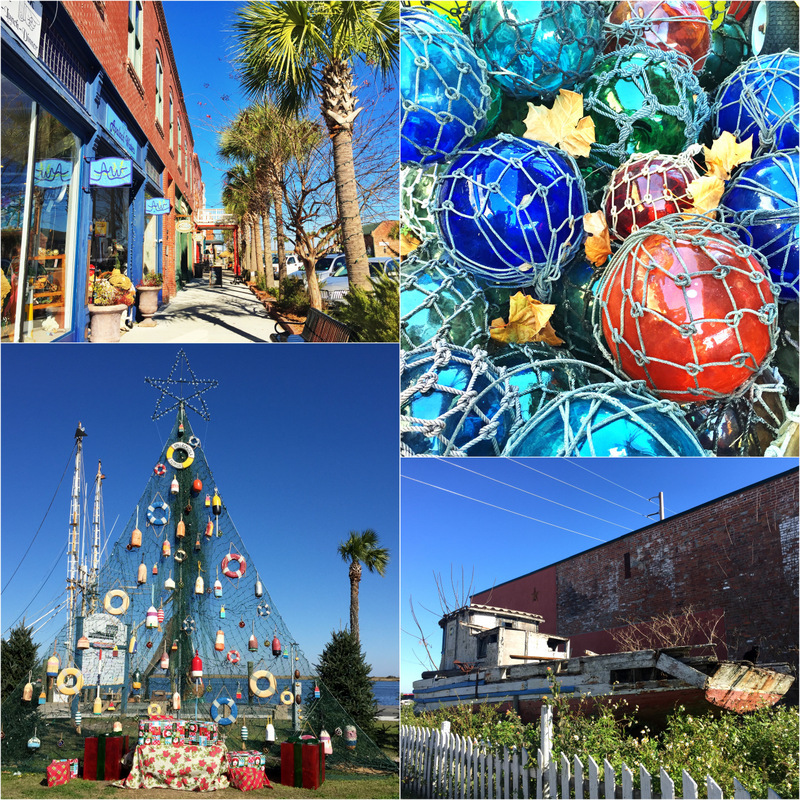 Our short stay meant that we didn’t have time to explore all of St. George Island, but we did spend a lovely afternoon in the historic town of Apalachicola. It was an unplanned stop on our way to the state park, prompted by what appeared to be a charming town full of historic buildings and a unique take on a traditional Christmas tree. We wandered around for several hours, exploring a nautical-themed antique store, a funky local artist gallery, and a tiny book store. Finally, we settled in at the bar in Tamara’s Cafe where we stuffed ourselves with fresh fish tacos and ice-cold sweet tea. Unlike my childhood memories of Florida, our trip along the panhandle introduced me to a different side of the Sunshine State. This area of Florida is now on my ‘favorite places list’, and I can’t wait to return.